Justin Thomas got America off to the perfect start on the last day of the Ryder Cup before paying a classy compliment to the man he beat. Rory McIlroy and Thomas went down the 18th all square but the Northern Irishman endured a nightmare hole and conceded on the fairway. McIlroy, who had kept a bogey off his card for 17 holes, blew it at the last when from a plugged lie in a bunker the ball rolled back into the sand. With Thomas in the centre of the fairway the Northern Irishman had to go for the green and his third shot caught the top of the trap and finished in the water. 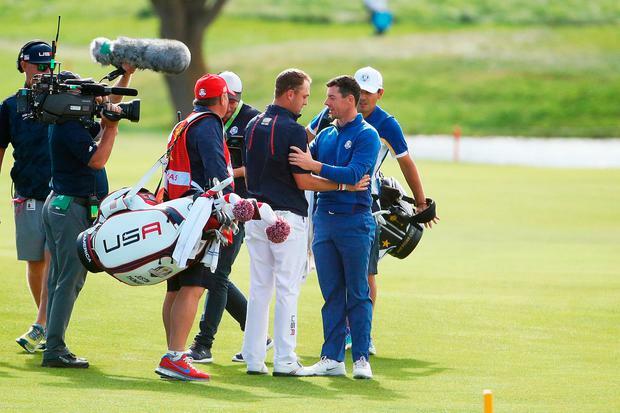 Thomas hit his approach to 10 feet and after McIlroy's fourth finished outside that, the players shook hands on the fairway to give USA their first point of the day with a one-up win. "I told Rory I've looked up to him for a long time," Thomas told Sky Sports afterwards. "I've always respected the way he's treated me, so it was pretty cool getting thrown out there in the first match and playing against him. "It was weird. We didn't get off to a great start but we both hit some quality shots on the back nine, hit some great putts and we just couldn't get it in the hole," said Thomas. "It wasn't a very fitting way for the match to end, I feel badly about that, but if it makes him feel any better I hit two really good shots. "It is one of the greatest compliments I've gotten to be a rookie and thrown out first."